Fees Must Fall student leader and activist, Bonginkosi Khanyile, finally free after spending five months in prison. It took 155 days in a Durban prison, and four trips to court, but finally, Fees Must Fall student activist, Bonginkosi Khanyile, was granted bail on Wednesday by the Constitutional Court. The Durban Magistrates Court refused him bail, twice, saying he had acted against his bail conditions from a February 2016 arrest, by participating in “illegal gatherings”. The Pietermaritzburg High Court concurred in October 2016, saying, Khanyile had been refused bail because he was an “inciter of violence” and would pose a threat to witnesses if granted bail, and the Supreme Court of Appeal said his release would interrupt the proper proceeding of the criminal justice system. But Khanyile’s lawyers were convinced that this was a misapplication of Section 60 of the Criminal Procedures Act which mandates an accused’s right to bail. “It’s actually remarkable that we have come this far, and for all the costs that have been incurred by our client to get this far, in order to receive this justice which we feel could have been obtained at an earlier stage in the lower courts,” Khanyile’s lawyer, Nhlakanipho Nxumalo, told Wits Vuvuzela. The state had argued that the reason for denial of bail was due to Khanyile’s influential role in political campaigns and that he remained a potential flight risk. Advocate Dali Mpofu, representing Khanyile, said the court was denying Khanyile bail for reasons that “he might act unlawfully again”. Prior to granting bail, the court speculated that the passing of time and changing circumstances since the time of his arrest in September, could allow for the applicant to reapply for bail at the magistrates court. The Durban University of Technology (DUT) student was arrested on September 27, 2016 on eight charges – including public violence, inciting violence and participating in an illegal gathering – during last year’s Fees Must Fall protests. Nxumalo said, “Our argument before the constitutional court was to say that the incorrect interpretation of Section 60 of the Criminal Procedure Act was obviously a misapplication of the law, and therefore gave rise to a constitutional issue which then ultimately gives rise to this court having jurisdiction, becoming necessary for this court to make pronouncement on this issue,” he said. The Constitutional Court granted Khanyile R250 bail on condition that he does not intimidate university security and staff and does not interfere with police operations. Nxumalo said the case of Wits Fees Must Fall leader, Mcebo Dlamini, and that of Khanyile are similar, however, they (the attorneys) were concerned with why Khanyile’s case was treated differently compared to other student activists who were arrested, but granted bail shortly thereafter. “It was actually a remarkable situation to find that the state was adopting this approach from the magistrates court, right up until we got up to the constitutional court, that this particular individual should not be released by the court,” he said. 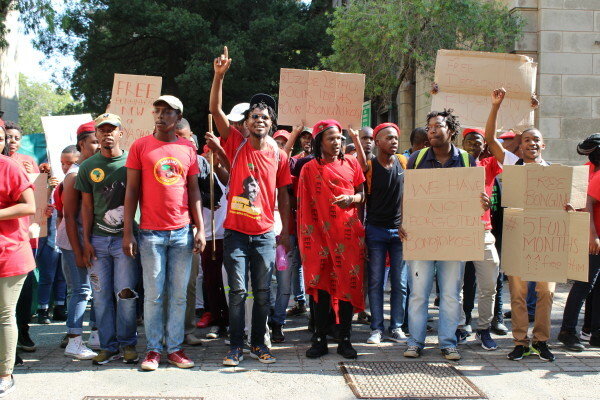 About 30 Wits Economic Freedom Fighters marched to the Constitutional Court in their red regalia and berets to show support for their DUT comrade, who was represented in court by his mother, Phumzile Khathini. They were joined by EFF commander in chief, Julius Malema, and many other supporters. EFF Wits branch student command leader, Koketso Poho, told Wits Vuvuzela that Khanyile’s case proved that the justice system is flawed and is “sometimes used to settle political scores of the ANC”. “The EFF exposed and continues to expose it [the justice system] as it did in the Mcebo Dlamini case and in the Jacob Zuma #PaybackTheMoney case,” he said. 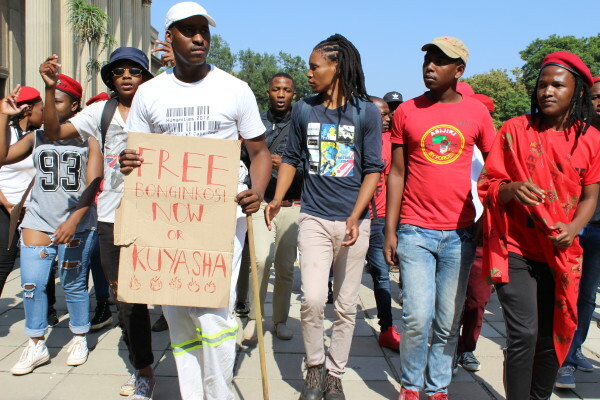 “What was proven today is that there is really nothing outstanding about Bonginkosi’s case other than that he is part of the most influential student movement,” Poho said.